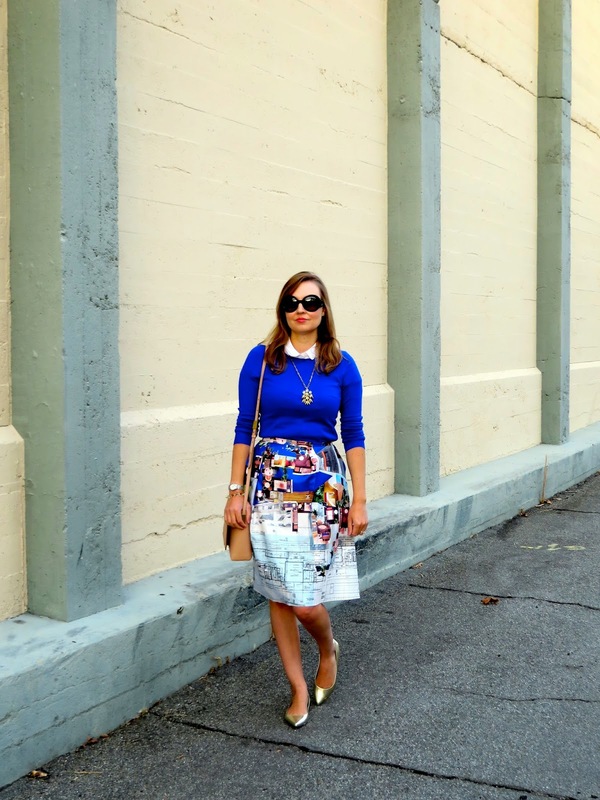 The skirt I am wearing today is nothing new; it's from one of my favorite posts from last summer, here, about Disney Hall. 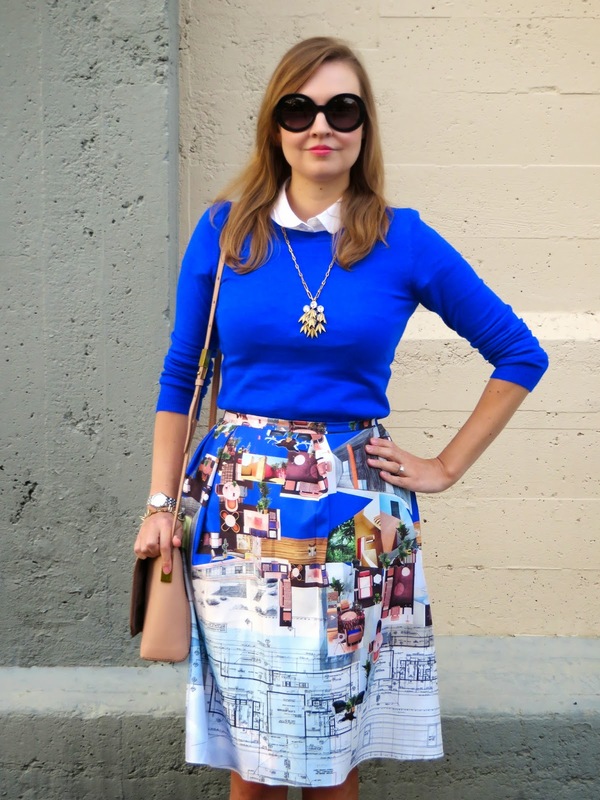 I tried to re-imagine the skirt for fall with a bright cobalt sweater to bring out all of the lovely blue hues featured in the skirt. 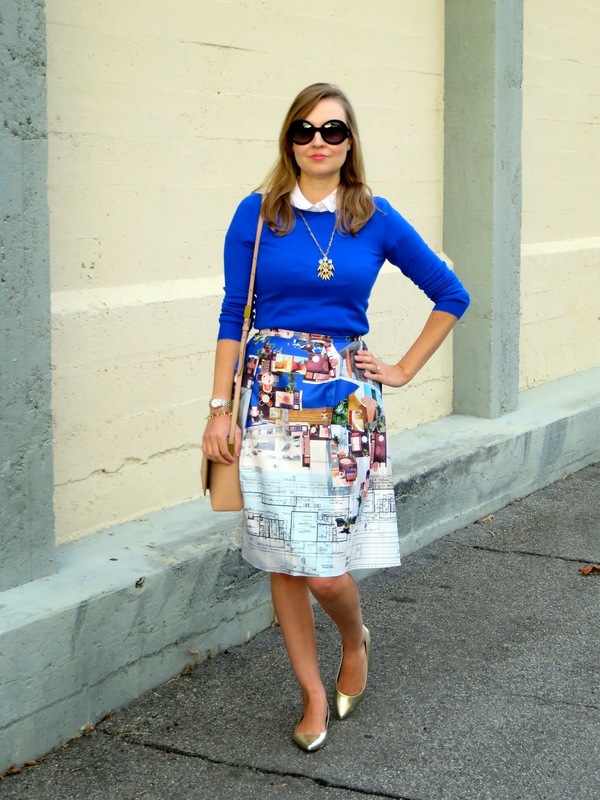 To be honest, this is one of my favorite skirts (I know I say that a lot, but this time I really mean it!) due to all of the quirky architectural details and blueprints it features. I feel like I need to photograph the skirt next to some mid-century modern masterpiece to compliment it. Maybe next time. 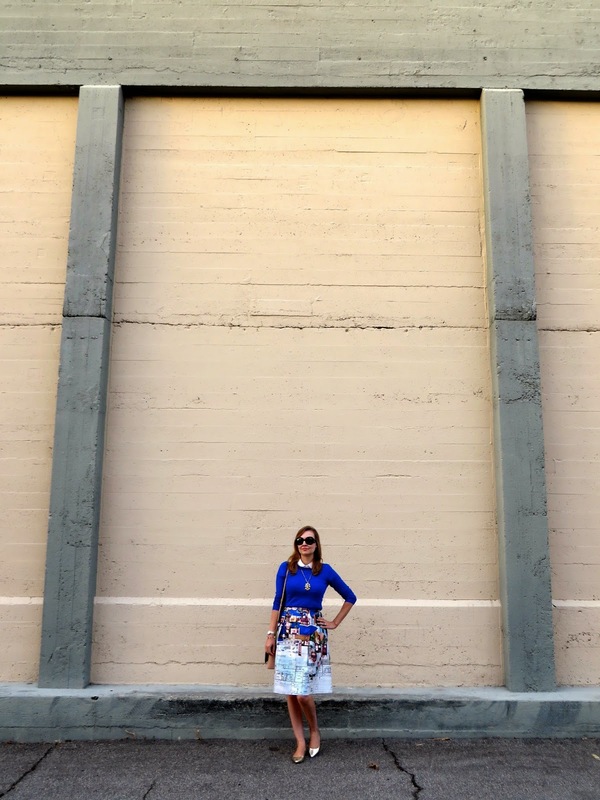 Speaking of locations for "photo shoots", after taking pictures of this skirt at Disney Hall this summer I felt like any other backdrop would just be a big let down. The one featured here isn't too far from us, and is conveniently near our favorite Mexican restaurant. Also, due to my hours at work and daylight savings, I am always rushing to get a quick picture in before the light dissipates. As my husband quotes, "rage, rage against the dying of the light!" So yes, I will not go gentle into that good night until I get at least a few blog pics in, or in this case several... err... maybe closer to a dozen! 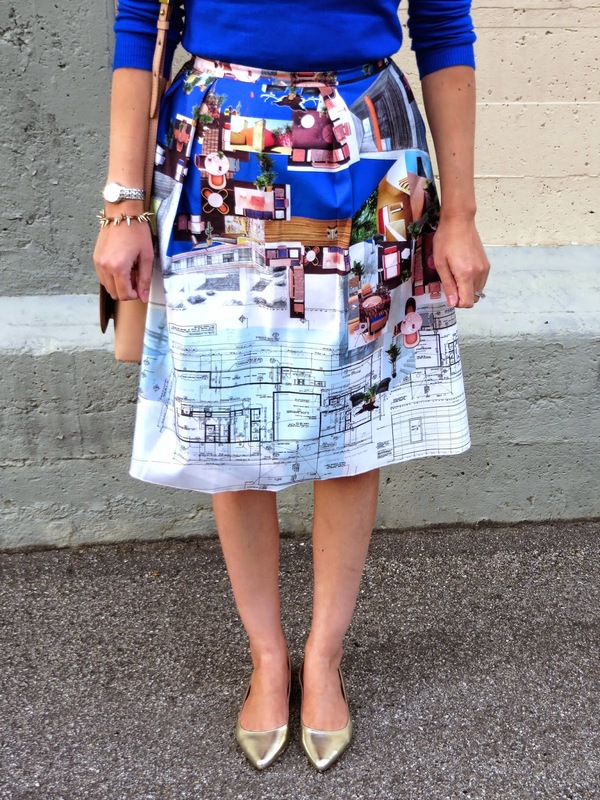 What a beautiful print on your skirt! I love your outfit and I really love that you are re-imagining your outfit for a different season. 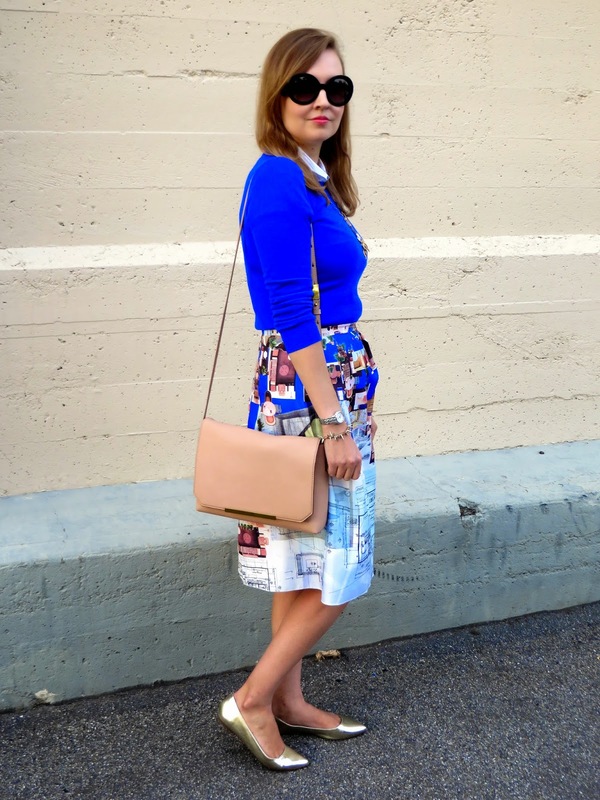 I am always so impressed that bloggers can wear a different outfit for every post! I am so happy I have stumbled upon your blog! I'm so happy you stumbled upon my blog Chelsea! I am definitely trying to do more in regards to making the most of things I already have in my wardrobe. Thanks for stopping by!